Reviewing Professor Layton and the Spectre’s Call, the fourth installment in the series of DS games, is tricky. Not because it’s a complicated game to describe or I’m scratching my head to decide on what I think about the game. It’s because it’s difficult to resist the temptation to grab a review of one of the previous games, alter the title and submit it. 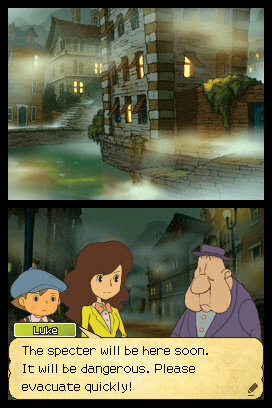 Yes, the new Professor Layton game is basically more of the same. OK, in the spirit of keeping your interest, I’m not actually going to leave the review at that, but basically if you are familiar with the previous games for the Nintendo DS then imagine them with more, different, puzzles – totaling over 170 this time – a different storyline and some new side-quests, but otherwise identical in practice. Fine with that? If you enjoyed the previous games and want new puzzles and a new storyline to follow, then it’s an essential purchase. If you hated the games with every swipe of the stylus, then you need to avoid this like the giant spectre of the game title. So now to those of you who have never played the game series before. Basically, Professor Layton and the Spectre’s Call is a story-focused touch-screen game which sees you exploring the village of Misthallery after receiving a letter, allegedly from the mayor, saying that a giant spectre is attacking the village and slowly reducing its properties to rubble. 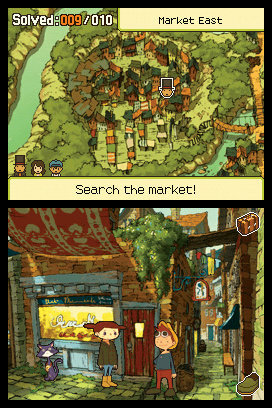 As the titular character, Professor Layton, an almost stereotypical Englishman complete with a large hat, a love of tea and a plummy voice, you have to explore this village and uncover its secrets by talking to villagers and solving on-screen puzzles to unravel the mystery of the spectre. On your adventures you are joined by assistant Emmy Altava and, shortly into the game, Luke Triton. Yes, the Luke that has appeared in the previous games, and he’s not with you from the very beginning because this game is actually one of three prequels to the original trilogy, with the next one due to hit our shores next year on the 3DS. In the plot, Luke can somehow predict when and where the spectre is next due to strike and there is some connection with a mysterious flute sound, but that’s all I’ll mention of the plot so as not to spoil the twists and turns that make this game appealing. The game is basically an interactive storybook told through beautiful hand-drawn cut scenes of Anime film quality that move the story along; comic-style character-based set pieces, and areas that you explore by moving around a map displayed on the bottom screen using directional arrows on the top screen. The storybook feel continues as you play the game as a ‘previously’ catch-up plays before you re-start, meaning you should hopefully never get lost in the plot. As in the previous instalments, the graphics of the game are beautiful with each screen a pleasure to look at. The music is orchestral and great to listen to, with a bank of sound effects, dragged over mostly from the previous games, that occasionally get too repetitive, but there is a bigger range used than on the older ones so you shouldn’t have to throw your DS through a window because of them. You progress through the game by moving around the map, talking to villagers by clicking on them and cycling through their words, occasionally getting these read out to you in voice, but mostly just as text. Every so often, a character will prompt you with a red exclamation mark and challenge you to a puzzle which you have to solve using the touch screen, with a wide range of different styles from word-based challenges to having to drag or move objects using the stylus, to leaps of logic, all at different levels of challenge. Also hidden around the maps are secret puzzles and, to help you with the puzzles, hint coins, which are found by randomly clicking areas of the maps. Hint coins allow you to get one of three hints on a puzzle you can’t solve, each more obvious than the last. Oh, and the ‘Super Hint’ returns if you are really struggling with a puzzle. Solving puzzles reward you with Picarats – no, not some weird mouse version of the Star Trek captain – depending on the difficulty of the puzzle and whether you solve it first time, with the available points decreasing as you make wrong answers. You can’t do anything with these Picarats but they do serve as a boasting point when you finish the game to see how well you did compared to your friends. Unless, of course, you didn’t do as well as you friends. Touch screen controls, when used, work well, plus you get the option to add a transparent memo pad over the puzzle to scribble notes on, à la that Zelda game that did a similar thing. Character recognition also works flawlessly in puzzles that you require you to write something. Thrown in with the game are various options also on the menu, some designed to help you with the game, others to expand your playing time. Layton’s Journal acts as a diary detailing your progress through the game to help you keep track. This coupled with arrows pointing your required direction to the next goal on the map help make this game much less frustrating when you come back to it after a few days than previous entries. Mysteries lists what mysteries lie in the plot and which ones you have yet to solve; Puzzle Index allows you to re-play completed puzzles or tackle unsolved ones you’ve found (plus you stumble across a cat in the game that stores puzzles you may have missed and no longer can access in the main game); and ‘Episodes’ give you extra little snippets of cut scenes to add to the story. There are also three little sub-games in this instalment as with the previous outings. Toy Train features ten levels that you unlock as you progress, where you have to lay track on a grid to navigate a train to stations and to its goal whilst trying not to run out of track and avoiding obstacles; Fish, a play on the similar section in Electroplankton, sees you aiming a fish to collect coins using bubbles as springboards, with all the coins needing to be collected within a certain time limit; and Puppet Theatre, possibly the weirdest of them all, has you acting out a puppet show using actions you pick up in the main game. All three games expand as you play the main story and, though amusing and at times tricky, are just side-games to extend the things you need to do. They are varied, fun to play and get challenging as you progress, so no complaints from something extra! There are a few other things to do in the game separate to the main story, including collecting badges from mice around the map screens (yes, I know, it is Japanese-style weird in parts) whose reasoning becomes clear later in the game, plus being able to unlock a bonus weekly puzzle if your DS is connected to the internet, as in previous games. You also get further bonus puzzles on completion of the game and fulfillment of certain criteria. Naturally due to the nature of the game, there’s no multiplayer, either local or internet, to speak of, but there are three save slots so you could, like I have, play it separately with family members to see who is better at different types of the puzzles. ‘Professor Layton and the Spectre’s Call’ is another great installment in the franchise. Graphically the map screens, animated cut-scenes and characterisations are as well-drawn and beautiful as ever and the music, which dominates the game and always risks being too repetitive due to the amount of time you spend wandering around, mostly veers away from being annoying. Characters are well-drawn in the conversation sense as well as their visual look and each has their own personality and there is a lot to like in following chats. Having played the three previous games, the puzzles are up there with variety and the increasing challenge but, like the game in general, you can’t get away from the feeling that you’ve seen it all before. Though a lot of the logic puzzles are fresh and unique, there’s only so many block-shifting puzzles you can endure over four games. If you enjoy games that are focussed on slow-burning stories and are happy to sit through many screens of dialogue between puzzles then there is much to enjoy here. Though it’s so similar to the other games they could help the police out with an identity parade, the story is great to follow and the puzzles are on the healthy side of challenging, and much pleasure can be got from seeing it played out. If you want a game that’s more fast paced and exciting then this is definitely not for you. Professor Layton and the Spectre’s Call cannot be called ground-breaking and it’s familiarity doesn’t make this the most exciting release of the festive period, especially sandwiched between Super Mario 3D Land and Mario Kart 7 on the DS’ newer cousin, but it’s enjoyable nonetheless and well worth picking up if you’ve enjoyed the previous instalments and want the DS equivalent of an interactive book that gets you engaged within its pages. Next year we’ll see just how Professor Layton on a 3DS can shake up the established formula and perhaps the most refreshing change in the series yet? Check back next year to find out! Hi, got this for Christmas and am finding it hard to progress as I can’t get into Lukes room …HELP!!! You don’t need to do anything just stand at Luke’s door and wait for the time to tick down.